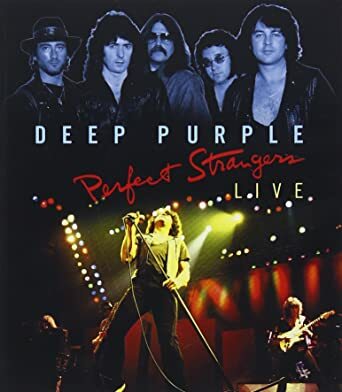 This DVD contains video originally filmed in 1984 in Melbourne, Australia during Deep Purple’s world tour called the “Perfect Strangers Tour.” This tour was to promote their new album, also called “Perfect Strangers.” For the first time since 1973, Ritchie Blackmore, Ian Gillan, Roger Glover, Jon Lord and Ian Paice were together again, the classic “Machine Head” lineup. There is a recent interview with Glover in the liner notes, where it is revealed that Deep Purple had to re-listen to their classic albums and re-learn the older songs. There is also bonus footage that contains press coverage from their world-wide tour. They played with a no frills stage, with just their equipment setup. A few times the video seems to show motion trails, which is common in older recordings, but overall it’s very good audio and video quality. On many occasions, they would start a song and go into an extended jam session and finish up the last part of the song. Blackmore was a master on guitar, blazing on the solos. Lord had many chances to shine, especially during the improvised organ segments. The rhythm section of Paice and Glover were still in their mid-70s form. And you could tell Gillan sang with passion and had a great vocal range, the classic screaming was very satisfying. This is the only concert film that exists from that era of Deep Purple. This DVD is a must have for all Deep Purple and rock fans.